“It's unusual for sociologists to study events,” says Robin Wagner-Pacifici. When describing her new book What is an Event? (University of Chicago Press), she explains that historians more often think about the implications of eventful, momentous, idiosyncratic, one-off episodes that stand out in narratives about the past. Events like 9/11, the Great Recession, or the Paris Commune of 1871-all of which Wagner-Pacifici examines in the book-don't fit neatly into sociology's attempts to articulate general laws about societies. Indeed, they may look like exceptions to these laws, and Wagner-Pacifici characterizes a resulting “skepticism about the ways in which events reflect something enduring about society.” From this disciplinary perspective, What is an Event? might read like a departure from typical sociological research. It does not, however, mark a departure from Wagner-Pacifici's distinctive scholarship and longtime curiosity about how events help shape our understanding of societies more broadly. 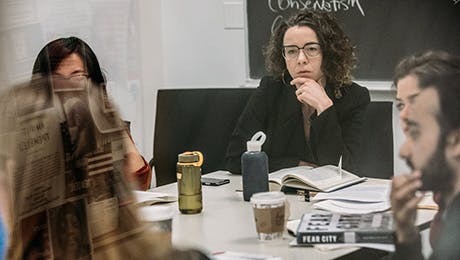 The University in Exile Professor of Sociology at The New School for Social Research says that she has always studied events, drawing from multiple disciplines in the process, precisely to discern what they might illuminate about social relations. Wagner-Pacifici describes a growing realization about the usefulness of events during the process of writing her dissertation on the kidnapping and assassination of former Prime Minister of Italy Aldo Moro, subsequently published by the University of Chicago Press as The Moro Morality Play: Terrorism as Social Drama. She says, “It struck me that I could usefully try to apply frameworks from other disciplines and other societies to contemporary events in large-scale modern societies.” In other words, a systematic study of the concept of events-the forms they take, why they feel exceptional, how they evolve, and how they weave themselves into ordinary life-can play a significant role in shaping how we think about the social world. In Wagner-Pacifici's account, we perceive events as breaks in what otherwise seems like the unremarkable continuity of everyday life, or what Wagner-Pacifici refers to as ground. “In order to better understand what makes a rupture feel so disorienting and disquieting, you have to understand how it is we navigate the everyday world that we consider the uneventful world.” Events become eventful when we perceive that they “emerge” from or “rupture” the ground we are used to navigating. Wagner-Pacifici describes specific events, not just to examine individual ruptures and their respective effects on specific societies; rather, she mobilizes them as cases that help to articulate how the construction of events might be understood more generally. At the heart of this argument lies the assertion that events only exist in the forms of their representation. “Forms matter,” Wagner-Pacifici says, “In fact, they are the matter of events. [Events] don't live anywhere else.” To put it differently, events exist in the ways that they are mediated: by news reports, paintings, novels and films, legal decisions, the creation of new categories of “enemy combatants,” social media feeds, and memorials. What is an Event? makes a specific intervention when it comes to this last form: the case of memorials. Wagner-Pacifici argues that memorialization plays a central role in the creation of events. “A monument is about cauterizing the event,” she says. To erect a monument typically marks an effort to collectivize memory and suggest separateness from the event itself. But Wagner-Pacifici offers an alternate interpretation, suggesting “the memorial is as much a part of the event as anything that happened.” Memorials become, in her account, an essential form in the creation of an event. Viewed this way, the building of a 9/11 memorial or the decision to locate an Islamic Community Center near “Ground Zero” has as much to do with the event as the hijacking of planes and the destruction of buildings. If an event is any one thing, then, it is always evolving.